Fluence MABR is an innovative, well-validated technology for low-energy treatment of municipal wastewater. It uses a spirally wound, self-respiring membrane sleeve to provide aeration by diffusion for the wastewater treatment process. The spiral membrane module at the heart of the biological reactor performs simultaneous BOD, TN and TP removal, all in a single pass. The Aspiral system arrives fully equipped and checked for fast installation and start-up. It incorporates durable membrane materials with a life expectancy of over 20 years. The MABR biological treatment has no moving parts which leads to reduced maintenance. 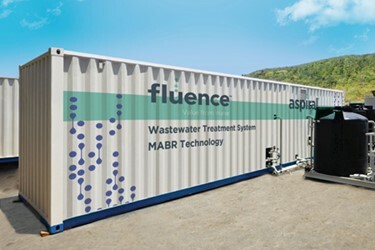 Aspiral meets the most stringent effluent regulations such as Class 1A (China) and Title 22 (US), and the effluent can be reused for agriculture and landscape irrigation with shorter implementation schedule and reduced regulatory procedure.